Protect your shoes from the snow! Have you ever stepped into a puddle of water, stomped through the slushy snow, or walked on salted sidewalks? Well then you must know the damage this has done to your shoes. 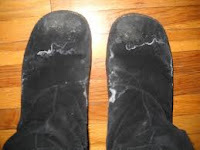 Leather and suede are the most commonly affected by snow and water. If you want to protect your shoe from these elements or want to fix your shoes' current condition, then here are some tips to help! See the white marks on these? To apply the cream and oil, use a dry cloth to apply and let it sit for up to an hour to wipe again to remove excess. Creams have advantages and disadvantages over using spray waterproof protectant. 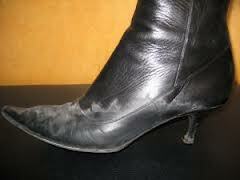 Creams and oils condition the leather but might change the color of the shoes slightly or create a layer of buildup. However sprays may not be as effective because they aren't being worked into your shoes. Understand the material your shoes are made of. Waterproofing for suede is different than leather. Using a leather spray on a suede shoe can ruin the shoe. Once you have the right spray, clean your shoes. You don't want to seal in dirt! Cover up anything on the shoe you don't want sprayed because it might change the color of it! Let shoes dry and weatherproof your shoes once a year to keep protecting! Give your shoes some love so you can keep wearing them!